When I stepped out of the house at dusk some time ago, a ring of squawking swallows filled the lower branches of the dogwood tree. Two titmouses complained nearby, one flashing and fluttering its wings at the far side of the tree trunk, all the while holding a green berry in its mouth. At first I thought I had stumbled upon a scene of avian turf wars, but the swallows seemed to be ignoring the the other birds and concentrating on something in the bushes below. And the berry-bearing titmouse seemed to be trying to scare something away, although from the distance it was keeping from the bushes, the something was in fact scaring the bird. 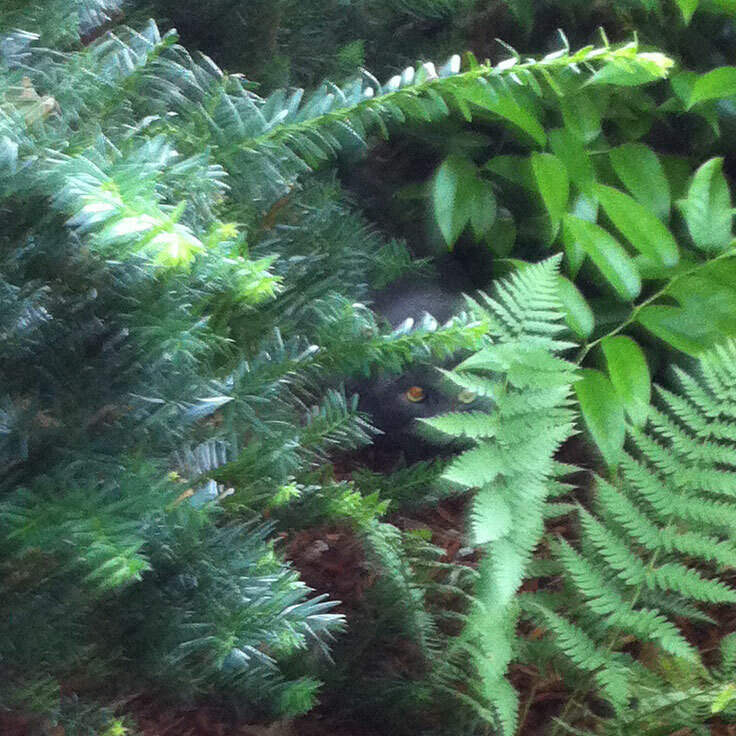 I cautiously peered into the gloom of the bushes and two eyes glowed back at me. 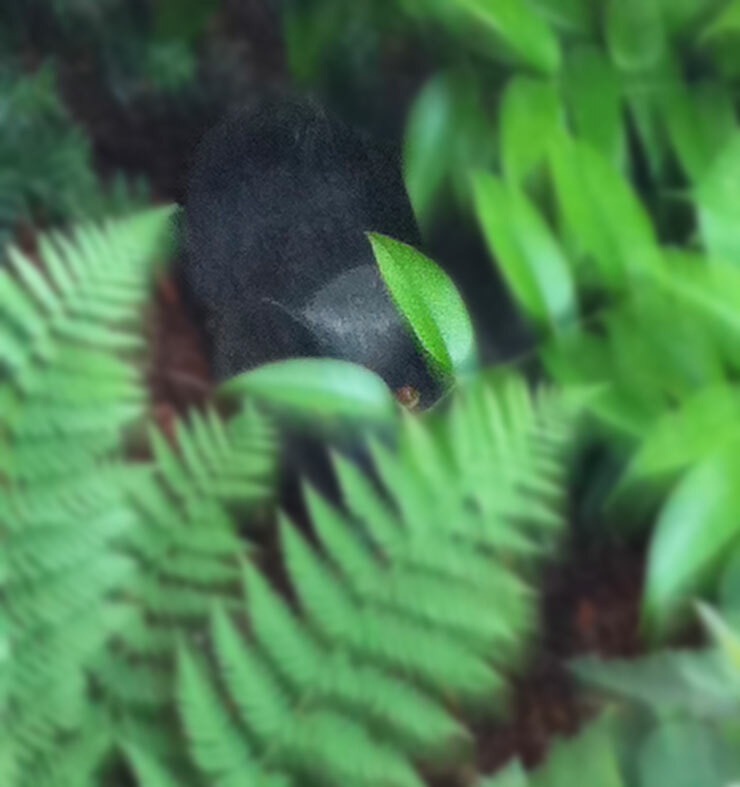 I made out the outline of a gray cat who never flinched at my attention. In fact, I got the distinct impression that he was saying, “Nothing to see here, move along. Tell the little birdies everything’s fine.” I snapped these pics, which show how well he was camouflaged. A few days later, my friend and not-too-distant Cambridge neighbor Maria was stunned by a coyote in her backyard. I supposed that the little urban jungle cat should watch his back. Which made me wonder where he was from, since there are few outdoor cats in our neighborhood anymore. My query was answered a couple of weeks later, when I happened to spy him on the ledge beside a second-floor balcony of the apartment building next door. Do his owners know that he gets out and about like that? Or does he wait until they leave and is always back home, greeting them with a slow, reproachful blink upon their return? Curious cat. I wonder which of his nine lives he’s on.